More than 60 years ago, in the midst of the Great Depression, a U.S. Rotarian devised a simple, four-part ethical guideline that helped him rescue a beleaguered business. The statement and the principles it embodied also helped many others find their own ethical compass. 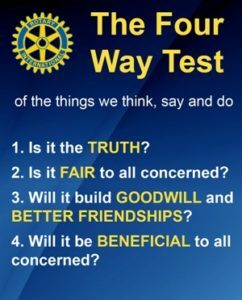 Soon embraced and popularized by Rotary International, the Four-Way Test today stands as one of our organization’s hallmarks. 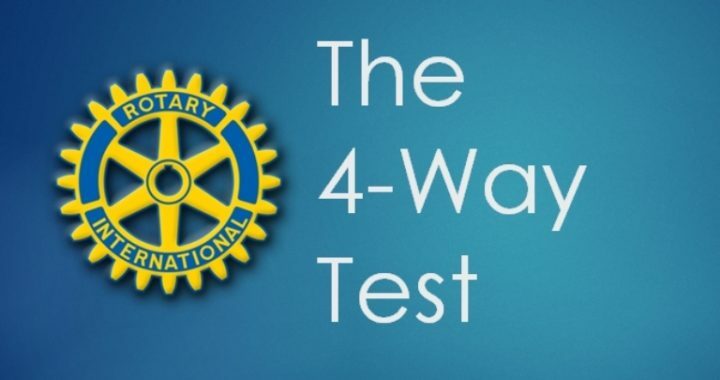 Today, more than six decades since its creation, the 4-Way Test still proves to be useful in modern society and is sophisticated enough to guide business and professional leaders in our fast-paced society. The 4-Way Test is international, transcending national boundaries and language barriers. It is recited at weekly club meetings around the world and takes center stage at our conferences and conventions. But, more than a memorized recitation, Rotarians are expected to apply this test when making decisions that affect others. Posted in Club Service and tagged Club, Leadership.